Shedden squabbled with Priaulx for much of the running, with reigning champion Colin Turkington also hanging on behind in the second Team BMR VW. Fellow stablemate Aron Smith had already been shuffled down the order after contact with MG’s Jack Goff at Graham Hill Bend, in an incident which hampered both drivers. Collard was busy falling through the order – eventually finishing outside the points paying positions – while WIX Racing’s Adam Morgan was quietly making solid progress. Having started tenth on the grid the Lancastrian was up to fifth by mid-distance, with Andrew Jordan’s MG and the impressive Speedworks Toyota of Tom Ingram tucked in behind. WSR’s Sam Tordoff was busy fending off Matt Neal’s Honda, the latter of whom recovered from a wild ride through the gravel at Paddock. With the race seemingly settled drama then struck leader Plato with just four laps to go. Approaching the ultra-fast and daunting Paddock Hill Bend his car careered off with what turned out to be a puncture. With Plato’s race now over, Priaulx almost simultaneously attacked Shedden for what would now be for victory. Contact at McLaren’s gave Priaulx a gap big enough to squeeze his BMW through on the way down to Paddock, but the Scot fought back immediately with a stellar move down the inside at Druids. Priaulx settled back into second to reevaluate his plan of attack, which was to come in dramatic circumstances. The attack came on the last corner of the last lap as Priaulx took advantage while Shedden was passing a backmarker. A tin-top tap from the Guernseyman followed sending both cars side-by-side towards the finish line. 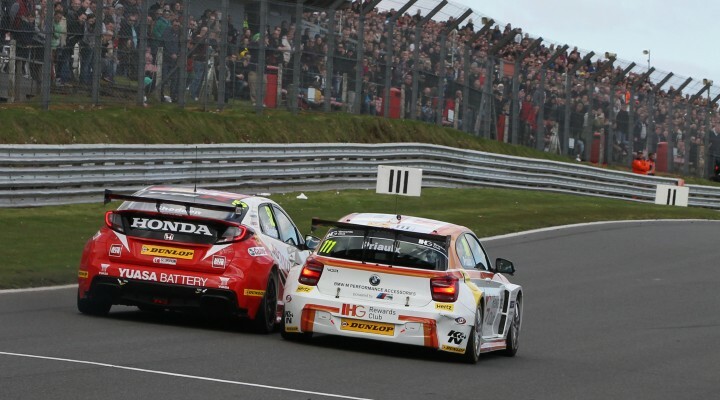 With the collective crowd cheering it was Shedden who held on to take one of the most enthralling and closest ever BTCC victories. Turkington took the first podium of his championship defence campaign while Morgan took an unlikely, yet well deserved, fourth place finish. The loudest roar came from the Honda camp, however, as the new Type R claimed victory in only its second outing. Click here for the final classification for Round Two of the Dunlop MSA British Touring Car Championship at Brands Hatch.